Secratary of State John Kerry on "This Week." A rush transcript of "This week with George Stephanopoulos" airing on Sunday morning, November 24, 2013 on ABC News is below. This copy may not be in its final form and may be updated. Breaking overnight, an historic deal. BARACK OBAMA, PRESIDENT OF THE UNITED STATES: We have a real opportunity to achieve a comprehensive peaceful settlement. STEPHANOPOULOS: The international community and America's long-time enemy forge a late night landmark pact to freeze Iran's nuclear program. Will it stop Iran from getting the bomb? If it falls apart, is war next? Joining us this morning, Secretary of State John Kerry. We go inside Iran. Plus, Martha Raddatz and Christiane Amanpour with all the breaking details and analysis. Then our powerhouse roundtable takes on the Democrats' stunning move to shake up the Senate. And America's lasting fascination with JFK. Plus, Facebook founder Mark Zuckerberg and Maya Angelou, calypso queen. MAYA ANGELOU, WRITER: I'm proud of that song in 200 years. STEPHANOPOULOS: Right here this Sunday morning. And we begin with that big news breaking overnight, after months of secret talks and high-stakes diplomacy, a deal between Iran and the west to suspend its nuclear program and get some relief from those sanctions that have crippled Iran's economy. It's sparking strong and split reactions we'll get right to Secretary of State John Kerry in a moment. First, ABC's chief foreign correspondent Terry Moran has more on the fine print and the fierce response. He's at the negotiating site in Geneva. Good morning, Terry. The deal hammered out in the wee hours of the morning here is full of either promise or peril, depending on your point of view. The headlines, Iran has agreed to suspend the growth of its nuclear program. It won't add to its stock of enriched uranium. It will degrade some of the most dangerous enriched uranium it has. And it has agreed to open up its nuclear facilities to daily inspections by international officials. The U.S. has agreed to ease sanctions to the tune of about $6 billion or $7 billion, that's actually a relatively small portion of the sanctions that have brought Iran's economy to its knee. And this whole thing is temporary, six months, neither side trusts each other here as they enter into negotiations to try to reach a comprehensive agreement lifting all sanctions in exchange for an end to Iran's nuclear weapons ambitions. That is a very tough nut to crack. STEPHANOPOULOS: No surprise, Israeli Prime Minister Benjamin Netanyahu trashing the deal, calls it a bad deal, an historic mistake. Says Israel is not going to be bound by the agreement. And he's going to do everything he can to prevent Iran from getting a nuclear weapon. MORAN: Absolutely, no question about that, George. And what Israel is going to do now is try to rally its support in the United States, in other countries and especially in congress to try to block this agreement by getting new sanctions imposed. Israel also made clear, prime minister has made clear, that Israel is ready to go it alone if necessary. So it will prepare, if necessary, some kind of military action, probably with the quiet tacit support of Saudi Arabia and other countries in the region, which are also terrified of the prospect of an Iranian nuclear weapon. STEPHANOPOULOS: The real test, of course, is six months from now. Will this lead to a deal that actually rolls back Iran's nuclear program? MORAN: Yeah, that's the big question. That is incredibly negotiation going forward. And the test of whether or not all of this -- people are talking about how it's making history, with a test of whether it's successful, is whether at the end of the day, Iran can become a normal nuclear country. Can it enrich uranium and have nuclear power transparently without lying or cheating? Can it be trusted with it? And can it join in a new kind of relationship with the United States and the west, those are the stakes there and they are very, very high. STEPHANOPOULOS: No question about that. Terry Moran thanks very much. STEPHANOPOULOS: Now to Secretary of State John Kerry. I spoke to him earlier this morning just after he sealed the deal. STEPHANOPOULOS: Thank you for joining us, Mr. Secretary Kerry. The big question right now, will this agreement really stop the Iranian nuclear program in its track? You've already got some critics in congress suggesting it won't. Marco Rubio says it will not freeze the Iranian nuclear program, makes a nuclear Iran more, not less likely. Lindsey Graham says unless the deal requires dismantling centrifuges, we haven't gained anything. Your response? KERRY: This negotiation is not the art of fantasy or the art of the ideal, it's the art of the possible, which is verifiable and clear in its capacity to be able to make Israel and the region safer. The fact is that Iran's ability to break out, George, will expand under this program. Therefore, Israel will be safer, the region will be safer, Iran's 20 percent uranium will be destroyed, therefore they are safer. Iran's 3.5 percent uranium stock will be frozen at its current level and the centrifuges will not be able to be installed in places that could otherwise be installed and advance the program. KERRY: The fact is, we will have daily inspections -- we will have daily inspections -- no, it's not. That's correct. That's the next step. Now, the choice people have is, do you want to sit there and argue that you have to dismantle your program before you stopped it and while you're arguing about this dismantling it, they progress. In 2003, Iran made an offer to the Bush administration that they would, in fact, do major things with respect to their program, they had 164 centrifuges. Nobody took -- nothing has happened. Therefore, here we are in 2013, they have 19,000 centrifuges and they're closer to a weapon. You cannot sit there and pretend that you're just going to get the thing you want while they continue to move towards the program that they have been chasing. We've actually succeed through the sanctions that congress put in place to be able to get to a point where we're locking in knowledgeably what their current level is and forcing them to go backwards. And while we go through these next six months, we will be negotiating the dismantling, we will be negotiating the limitations. But you can't always start where you want to wind up. And most people I've talked to who have looked at this carefully, say the alternative that they're proposing just doesn't work. STEPHANOPOULOS: There also seems to be a clear difference between the United States and the Iran on the issue of whether they have the right to enrich uranium. You say the deal does not include any recognition of that right, the foreign minister of Iran says it includes it in two distinct places. I just want to know, what is the U.S. position? Does the U.S. respect and recognize that right of Iran's? Yes or no? KERRY: No. There is no right to enrich. We do not recognize a right to enrich. It is clear, in the -- in the NPT, in the nonproliferation treaty, it's very, very that there is no right to enrich. But under the terms of this agreement, there will be a negotiation over whether or not they could have a very limited, completely verifiable, extraordinarily constrained program, where they might have some medical research or other things they can do, but there is no inherent right to enrich. And everywhere in this particular agreement, it states that they could only do that by mutual agreement and that nothing is agreed on until everything is agreed on. That language appears at least twice in significant places in this agreement. So, there is no agreement that they can enrich. They have the ability to negotiate it, but they could only gain that capacity to have some enrichment as some countries do, if they live up to the whole set of terms necessary to prove its a peaceful program. So, Iran has some very stiff hurdles that they are going to have to meet in order to do that. There is no right and no right granted in this agreement. KERRY: They have the right, according to NPT -- let me say, George, they do have a right, any country has a right, if you're in the NPT, to a peaceful nuclear program. That -- there is a defined within the NPT. But a peaceful nuclear program does not mean you have the right to enrich. STEPHANOPOULOS: We have just the Israeli Prime Minister Bibi Netanyahu call it a bad deal. Are you confident that you can convince him to respect it and that Israel will not take unilateral military action against the Iranian nuclear program? KERRY: Well, actually, Israel and the United States absolutely share the same goal here. There is no daylight between us with respect to what we want to achieve at this point. We both want to make it certain Iran cannot have a nuclear weapon and Iran cannot be in place where they can break out and suddenly get that nuclear weapon. STEPHANOPOULOS: But the prime minister says this deal won't do that? KERRY: With this -- that's not accurate. The deal is the beginning and first step. It leads us into the negotiation so that we guarantee that while we are negotiating for the dismantling, while we are negotiating for the tougher provisions, they will not grow the program and their capacity to threaten Israel. Israel will actually gain a larger breathing space in terms of the breakout capacity of Iran. It's just clear. STEPHANOPOULOS: The U.S. has pledged in this deal to hold off on new sanctions for six more months. The president said now is not the time for new sanctions. Are you confident that you can convince congress not to pass new sanctions? And if they do, will the president veto them? KERRY: Well, George, I believe congress will recognize that this deal actually has a great deal of benefit in it. And I look forward to going up and working with our colleagues on The Hill in order to try to persuade them that this is not the moment to increase sanctions. I'm confident that as congress examines what we have been able to achieve here, and as they measure the fact that if you didn't do what we were doing, they would be marching forward and putting more centrifuges in, enriching more, moving closer to a weapon. What we have done, absolutely, unequivocally, allows us to get into Fordow, know what they're doing in that enrichment, stop the enrichment. And if they're not prepared to do the things necessary to be able to have a peaceful program, truly peaceful and provable as such, then the sanctions can be turned back up and, of course, he always have every option available to him as commander-in-chief. STEPHANOPOULOS: And finally, Mr. Secretary, you just emerged from the first face-to-face negotiations with the Iranians since 1979. Is the U.S. now heading toward a normal relationship with Iran? And how do you reconcile your experience with the words of their supreme leader, who calls Israel a rabid dog and accuses the United States of war crimes? KERRY: Well, obviously, those are the -- those are the most insulting and unacceptable terms, obviously. I mean that goes without stating. And we don't accept that kind of terminology. And we hope that's not going to be part of the future. But we're not going to sit around and deal with hopes or words and pretend that there's trust where it has to be built over a long period of time. So we have no illusions. This is not going to change in one fell swoop and overnight. We have a long building process to engage in here. We need to put to test Iran's words and intentions, without any cobwebs, without any, you know, false assumptions without any illusions. This is a hard road. And we will stand by Israel 100 percent. And I believe we will show that this particular approach has the ability to be able to garner greater, broader international support for whether or not Iran is, in fact, following through on its commitments or not. If you, ultimately, have to hold them accountable because they're not doing it, you have to be able to show that you've gone through all of the diplomatic avenues available before considering other alternatives. STEPHANOPOULOS: Mr. Secretary, I know you've been going around the clock. Thank you very much for taking the time to be with us. STEPHANOPOULOS: Reaction now from Republican Senator Saxby Chambliss, a member of the Intelligence and Armed Services Committee. Senator, thank you for joining us this morning. STEPHANOPOULOS: Is this a deal you can support? CHAMBLISS: Well, George, you know, the publicly stated goal of this administration, relative to Iran's nuclear program, is to prevent it from happening. Nothing in the details that I have seen thus far, of the final deal, nothing in what Secretary Kerry just said, moves us in the direction of preventing Iran from developing a nuclear weapon. Sure, they're going to destroy uranium to 20 percent, but irrespective of what he just said, they're going to be able to continue to enrich uranium to 3.5 percent. They've got six tons now, they're going to allow them to go to seven tons and then they'll come back down to six tons within the next six months. But they'll still have that capability. Nothing in this deal requires the destruction of any centrifuges. They're going to continue to be able to replace centrifuges that become inoperable. And I just don't see this movement in the direction of preventing Iran from developing a nuclear weapon at all. And what we're going to be doing is we're going to be easing sanctions. Right now, the sanctions are working. They're doing exactly what they're designed to do. The economy of Iran is heading south. Unemployment is skyrocketing. And what we're going to do is we're going to allow the easing of sanctions, particularly on areas where the Iranian people are going to feel some benefit, i.e. Allow export/import of automobile parts, airline parts, that sort of thing, that will show that the sanctions are, in fact, being eased. And instead of easing them, now is the time to tighten those sanctions. CHAMBLISS: -- Iran from developing a weapon. STEPHANOPOULOS: You heard Secretary Kerry. He says he hopes the Senate does not move forward -- Congress does not move forward on new sanctions. It sounds like he's going to be disappointed. You're going to push ahead. CHAMBLISS: I think you're going to see a strong movement in the United States Senate to move ahead to tighten sanctions. Now, there will have to be some time frame in there. They've done this deal. And this can be done without the approval of Congress. So for the next six months, it looks like this deal is going to be in place. And it may be that we have to pass a resolution that puts sanctions on effective three months, four months, six months, whatever it might be. But now is just not the time to ease sanctions when they are working. CHAMBLISS: We've got all of the leverage in the negotiation. And we've let them out of the trap. STEPHANOPOULOS: So your bottom line is if a permanent deal does not roll back the Iranian nuclear program, you're going to push ahead for more and tighter sanctions on the Iranian economy? CHAMBLISS: Exactly. George, we have trusted the Iranians before, just like the North Koreans on nuclear issues, and what have we gotten for it? They continue to hide their development of these weapons. And, you know, in spite of their agreement here to reduce the enrichment, the 20 percent stockpile they have enriched, they can go to North Korea and buy that from them in a heart beat. So, when you look at what we have really gotten out of this, it's moving us away from the direction of prevention of them developing a weapon. And that, frankly, is what the American people and what the world wants. And that's why you're seeing Israel and Saudi Arabia and there will be other Middle East countries, I suspect, who come out in opposition to this short-term agreement. STEPHANOPOULOS: Senator Chambliss, thanks very much for your time this morning. STEPHANOPOULOS: Let's go to Skype now for how this is playing inside Iran. Thomas Erdbrink is the New York Times bureau chief in Tehran. What is the mood this morning? THOMAS ERDBRINK, NEW YORK TIMES: Well, you know, what was very interesting, as I came back from the press conference with President Rouhani, I was almost embraced by my neighbors for years were asking me, Thomas, what will happen with the nuclear program? Where is this heading? Will there be more sanctions? And today for the first time in a long time, they were all smiling. Before that, I was invited to a selected press conference at President Rouhani's office. He said that the regime of sanctions against Iran has now been broken. It's interested to seeing the Iranian journalists who are of course first journalists and secondly Iranians as they so themselves how happy they were, how upbeat. And they are sharing a feeling that a lot of people here in Iran are actually at this morning saying they are experiencing, which is one of happiness, of hope. I called to the man who normally exchanges my dollars for me. And he told me that the Iranian national currency which has lost over 100 percent over the last years because of sanctions to the dollar, had actually gained some strength this morning in another sign that also business people feel that this agreement is one that will bring Iran forward in the coming months. STEPHANOPOULOS: Thanks for that, Thomas. Our team of experts here now to analyze and debate the deal: ABC's Christiane Amanpour and Martha Raddatz, the President of the Council on Foreign Relations Richard Haas, and Bill Kristol, chairman of the emergency committee for Israel and editor of the Weekly Standard. Thanks to all of you. And Christiane, let me begin with you. We just heard that report from Tehran right there. There was no question that leading up to this agreement, the pressure was really starting to build inside Iran because of the sanctions and President Rouhani elected in part to get that relief. CHRISTIANE AMANPOUR, ABC NEWS CORRESPONDENT: That's absolutely right. And just anecdotally when Foreign Minister Zarif came into the press conference in Geneva to announce the deal, there was a huge cheer for the Iranian reporters showing you how much they wanted this to happen. Because you're right, these sanctions have indeed hurt the Iranian people very, very much, not so much the regime. And I think that, you know, what you just heard from Senator Chambliss and others and Secretary Kerry, here's the deal about sanctions, I think we should be very clear about this, this is what the facts show, that sanctions, yes, have really hurt Iran, have hurt the economy, have hurt the people and were a long way to why Rouhani got elected. But, sanctions have not stopped Iran from continuing its nuclear program. You heard what Secretary Kerry said, 160 centrifuges before the sanctions ten years ago, 19,000 now. So if the deal is to try to get Iran to capitulate and to surrender in terms of finishing their nuclear program, that hasn't worked. So intelligence people here in Britain and others who are very aware of what's been going on have told me this interim deal is a good deal, it is significant freezes and suspension by Iran for very modest, temporary reversible sanction relief by the United States. STEPHANOPOULOS: And Christiane, we saw that reaction from Prime Minister Netanyahu in Israel. What about the rest of the region? AMANPOUR: Well the rest of the region, it depends on which part of the region. Yes, Israel, Saudi Arabia and the Gulf Arab states, freaked out. They don't want to see any lessening of pressure on Iran, part of it is because Israel is very concerned. The Saudis are in a Sunni-Shiite proxy war for influence in that part of the world. They don't want to see any let up on Iran. Other parts of that region want to see, you know, less tension. So, they want to see a deal. But of course, the deal is six months. And we're not going to know what's going to happen in a comprehensive deal that's going to require a lot more from both Iran and the United States. STEPHANOPOULOS: A lot of harsh negotiating ahead, that's right. I want to go to Martha Raddatz. We're also learning this morning fascinating that we not only had these high-level negotiations going on in Geneva, but separate secret talks for the last several months between the United States and Iran. MARTHA RADDATZ, ABC CHIEF GLOBAL AFFAIRS CORRESPONDENT: I loved this part of the story, George. Imagine U.S. officials going over to Oman and in Geneva on a military airplane into Oman, this is the deputy secretary of state, William Burns, and a man named Jake Sullivan, who is the principal foreign policy adviser for Joe Biden. They went over there, met with senior Iranian officials and nobody really knew about this, including some of our closest allies, including Israel. And they basically set the stage. They had about five secret meetings saying, how do you we get to talks? STEPHANOPOULOS: At the same time, we're also seeing this big debate now about what this actually does to the Iranian program. Secretary of State Kerry saying it expands the period it will take them to get a nuclear weapon. You hear -- Senator Chambliss completely disagrees. What is the United States's estimate for how much time this is buying us? RADDATZ: The experts I've spoken to just a short time ago believe it doubles the time to breakout, when the Iranians could push for a nuclear weapon. The worst case was one to two months. The Israelis certainly believed it would probably happen in one month, maybe just weeks. They believe this would double the time because it eliminates the production of 20 percent highly-enriched uranium. STEPHANOPOULOS: So not even close to a permanent deal. STEPHANOPOULOS: But you're calling it, Bill Kristol, just a pause that refreshes the ability of the Iranians to keep going on their program. BILL KRISTOL, EDITOR, THE WEEKLY STANDARD: Right. Taking breakout time from one to two months to two to four months in return for breaking the sanctions regime? That strikes me as a terrible deal. Of course the Iranian regime is very happy with this deal. And our allies are very unhappy with it. And our allies are right to be unhappy. And the Iranian regime, unfortunately President Rouhani is gloating, and he's right to gloat. STEPHANOPOULOS: But the question, Richard Haass, is going to be, I guess, which is more reversible, the relief of the sanctions or the Iranian program? RICHARD HAASS, PRESIDENT, COUNCIL ON FOREIGN RELATIONS: We're not going to find out until we actually get either to a final deal or this unravels. Each side is selling it that they're basically getting more than they're giving up. But I think at the end of the day, George, this is a limited deal that does limited things for a limited duration. And the real focus actually should where we go not over the next six months, I don't know why everyone keeps using that time period. It's one year, if you read the text, the goal is within one year to complete the negotiation and begin the implementation of the so-called comprehensive follow-on deal that, by the way, is of unknown duration. Big issues to come. STEPHANOPOULOS: So you have been inside the State Department, what will now happen for the next several months? HAASS: Well, in the short run, it's going to be defending this amongst -- against people, for example, in Congress who are focusing on new sanctions and the rest. But then it's going to be spell out all of the details. There's -- well, how many centrifuges will Iran ultimately be allowed? Of what modernity? How much enriched uranium even at a low level will Iran be allowed to keep? What will be the detailed nature of the inspections? How often? At what sites? What about sites we may not know about? There is so much that remains to be negotiated here. STEPHANOPOULOS: And, Bill, what do you think -- how much time do you think Prime Minister Netanyahu is willing to give the United States? Clearly at least six months. STEPHANOPOULOS: You could see him acting militarily before the six months is up? KRISTOL: Whether they could deceive even during the six months. From his point of view, Iran's gamble over the last 10 years of cheating, lying, and deceiving, has paid off for them. They are getting sanctions relief, which is really unbelievable, dismantling nothing and getting sanctions relief. RADDATZ: ... that monitoring. As Secretary Kerry said, every day they'll be in places they haven't been before. KRISTOL: But they apparently -- David Sanger reports in The New York Times that they did not get the standard of monitoring and inspection that the IAEA wanted. But to answer your question, I don't think the prime minister will think he is constrained by the U.S. deciding to have a six-month deal. It's as Richard says, six months, one year, I mean, if they're going to break out, they're going to break out. STEPHANOPOULOS: And, Christiane, how much time do you believe that President Rouhani and his team have to continue the negotiations? They're under some constraints by the Iranian supreme leader as well. AMANPOUR: They are. But here's the difference, why hasn't this happened before because Iran was unable to do it before? Under the completely contemptible time of Ahmadinejad, there was no way that this was going to happen. And it was static for a long time. Now Rouhani has done what many people think is the impossible, and that he has the Khamenei behind him. And Khamenei has brought the other, you know, bits of consensus of Iran behind for the moment. And by the way, this isn't historic. In 2003, et cetera, it was frozen for two years and suspended the entire program. So I think in terms of time, where the Israelis are really concerned it's the about the Arak heavy water reactor, this deal apparently says that they cannot proceed with Arak, they cannot introduce fuel into Arak. And, of course, Israelis have told me that if, you know, they need to, they might go off to Arak even if the U.S. doesn't at all. So I think the Arak thing is very, very important. And what I'm being told is that in the future, Arak cannot be a heavy-water reactor, it cannot be a plutonium producer, a route to another bomb. It must be converted to a light-water reactor. We'll see. STEPHANOPOULOS: Finally, Richard Haass, what are the odds that this actually does lead to a permanent agreement that actually prevents Iran from having a nuclear weapons program? HAASS: Preventing -- it won't do that much. Negotiations like this, George, don't solve problems. What they do is manage them. Think of this as a condition to be matched. It will put ceilings. It will put constraints on it, arrange for inspections. But what you're talking about the end of the day is how much is going to be allowed? And how much time will we have? That if Iran decides to cheat or break out, how much warning will we get? It won't do away with the threat of an Iran nuclear program, the real question is how much warning and how much confidence do we have in that warning? And that introduces either a degree of stability or instability into the Middle East. STEPHANOPOULOS: OK. Thank you all very much. Powerhouse "Roundtable" is up next. All the week's politics, including a stunning shake-up in the Senate, and America's enduring fascination with JFK. Plus, Facebook's Mark Zuckerberg making moves from Silicon Valley to Capitol Hill. MARK ZUCKERBERG, CHMN. & CEO, FACEBOOK: The vast majority of leaders in Washington have said that this should happen. So why isn't it happening? STEPHANOPOULOS: A powerhouse "Roundtable" is next, their take on the nuclear option shaking up the Congress, President Obama's tanking polls, and JFK remembered. SENATOR HARRY REID: This is about making Washington work regardless of who's in the White House or who controls the Senate. SENATOR MITCH MCCONNELL: You'll regret this and you may regret it a lot sooner than you think. (UNKNOWN): This war has escalated. This war on both sides. SENATOR JOHN MCCAIN: My friends, we are approaching a slippery slope that will destroy the very unique aspect of this institution called the United States Senate. STEPHANOPOULOS: Big change in the Senate this week. No more filibusters for presidential appointees or lower court judges. Let's debate that now here on the Roundtable. Bill Kristol is back along with our ABC Team, Cokie Roberts, Donna Brazile, Matthew Dowd. And Donna let me begin with you. You heard Senator Reid; it was a pretty big move from Senator Reid this week. They call it the "nuclear option" the Senate because it's such a massive change in Senate rules. You heard Senator McCain right there, it's going to change the way the Senate works, shouldn't be done. DONNA BRAZILE, DEMOCRATIC STRATEGIST: Well I disagree, of course, with Senator McCain. But you know with all the conversation this morning about the nuclear deal with Iran, this is a melodramatic phrase to talk about the nuclear option being eliminated. The truth of the matter is George, is that the Senate Democrats have gone back and forth, back and forth, with Republicans for the last two years. To try to come up with an agreement that was consistent to continue to allow the administration appointees, their executive appointees and the judicial appointees to get through. Not the Supreme Court. And you know they just couldn't keep this deal. So Senator Reid at the urging of his caucus decided this was time to go ahead and to have a deal where simple majority rules. So the president will be able to get his nominees through and the Senate will be able to function. COKIE ROBERTS, ABC POLITICAL ANALYST: The Senate can't function. The Senate's not functioning. I mean, and I thought it was quite remarkable for Harry Reid to say "the Senate is not functioning." He's the majority leader. Doesn't he have some responsibility for the Senate not functioning? STEPHANOPOULOS: Well he doesn't have the votes. ROBERTS: But now what we've got is they've tried right after this to bring up the Defense Bill; they can't bring up the Defense Bill. It's not functioning. Any member of the Senate can put a hold on any nominee. All it's going to do is make everybody madder and make it worse, rather than easier. MATT DOWD, POLITICAL ANALYST: To me this is like, this isn't the problem; this is a symptom of the problem. The problem is obviously complete dysfunction in Washington, D.C. And I'm, there's a virus going around in Washington, D.C. and it's a virus of hypocrisy. DOWD: Before he was for it. Mitt McConnell was for it before he was against it. President Obama was against it before he was for it. In the end what's happened is what's happened in the country writ large. I was looking at the data the other day. Eighty senators 25 years ago were from swing states. Twenty-five years ago 80 senators, 20 are from swing states today. The problem in Washington, D.C. is you cannot have the same rules today as you did before. You can't have the same rules in chess that you now have in mixed martial arts. And that's the situation we're in. STEPHANOPOULOS: So it's reflecting the situation we have in the country but Bill Kristol I wonder if it's going to intensify the kind of polarization that we've already seen. Make the Senate a little bit more like the House, where a majority rules, and essentially start to move us towards parliamentary government. Whenever a party is in charge, they're going to get their way. BILL KRISTOL, EDITOR "THE WEEKLY STANDARD": Yeah, no I think so. I mean I think we're being too nice here. A plague on all houses. Harry Reid agreed with Mitch McConnell that this would not happen in this session. They actually negotiated something at the beginning of the session. ROBERTS: A lot of executive branch appointees. BRAZILE: Eighty-two under President Obama. KRISTOL: But a lot of those filibusters were because Harry Reid, in fact, introduced the bill, filled the tree, as they say, with amendments and then invoked cloture and then it's called a "filibuster." The fact is Harry Reid has been, I mean Mitch, look there's a lot, some blame on all sides but Reid's behavior as Majority Leader has been pretty amazing. The House routinely passes legislation the Senate simply doesn't take up. They don't, it's fine, bring it to the floor. If they want to filibuster, filibuster. If the Democrats have the votes to beat it, beat it. But they don't even take up stuff that that the Houses passes. ROBERTS: But there are more than 200 nominations sitting there not confirmed. And that is, that is dysfunctional certainly. But Matt's point is the real point. Is that the Senate's just reflecting what's going on in the country. And so you have, in the 1990s, as recently as the 1990s, more than one-third of the Senate voted in the middle. And now you don't have one member in the Senate who's voting record is somewhere between the most conservative Democrat and the most liberal Republican. DOWD: And George when you look at this, I know that a lot of people are reflecting back on what the Founding Fathers and what they say. Boy this is going to be the worst thing since Thomas Jefferson and all that. We also must keep in mind that the Founding Fathers warned against day in and day out, including President Washington, about the power of political parties. And the power of parties to tear apart the government and create this dysfunction. We are at a point now where the political parties and people line up in these tribes and it's very difficult. As I say, you can't have the same rules in chess oh we're going to be fine and all that, as you have in mixed martial arts which is where the situation is today in Washington. STEPHANOPOULOS: (inaudible) what does that mean for President Obama's second term? We had a new ABC News poll come out this week that shows he's continuing to drop on the heels of this trouble with Obamacare. The president's job approval rating now 42%. That's marking the low of his time in our ABC Washington Post poll. For the first time, less than a majority of American's see him as honest and trustworthy. And now a full 70% of the country says we are on the wrong track. I think Donna there was some hope, you were expressing oh this is going to break the gridlock. But this is likely to poison the well on everything else the president wants to do, especially when his poll numbers are so low. 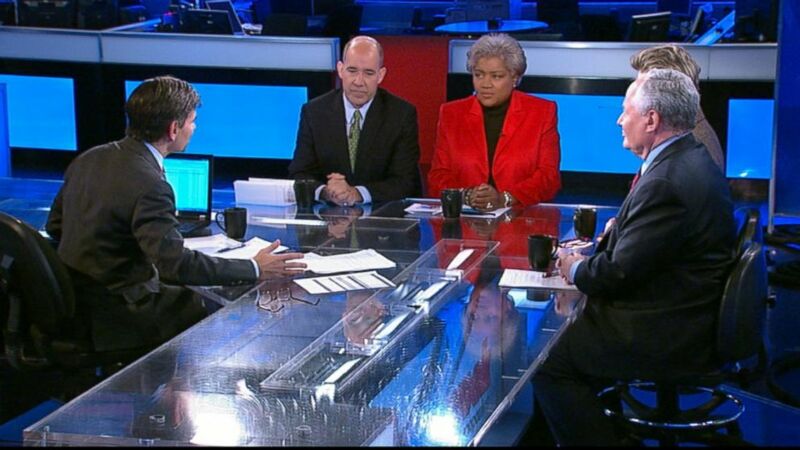 BRAZILE: So what do we go back to hyper partisanship on steroids? The fact of the matter is that Congress is already mad as hell. They're, we're not interested in getting a lot done. I think the president's going to have to continue to push them, push them on immigration, push them on the Farm bill and of course with all of the budget agreements coming to a deadline pretty soon, he's going to have to continue to see if he can bring some of the middle together. The truth is that Washington, D.C. is dysfunctional. The Republicans enjoy gridlock because they really, and we saw this week, they have no other agenda. DOWD: Republicans passed legislation to let people keep their health care if they like it. Which if I recall is something the president vaguely said that people should be able to do. It's not been brought to the floor of the Senate. The Republicans aren't responsible for gridlock in this situation. BRAZILE: They're not responsible for gridlock? DOWD: No, the House of Representatives have passed quite a lot of legislature, and this was passed with 39 Democratic votes. Thirty-nine Democratic votes. ROBERTS: Both sides are responsible for gridlock. DOWD: Where we are today George, where we are today is the president in 2008 and 2007 ran on the idea that he was going to bring the country together, bring Washington together. We're going to get past the partisan gridlock. We're going to get past the vitriol. And now we're at a point where the rules have to change in the Senate because it's become so polarized, so vitriolic that we can't get it done. DOWD: And the president's job approval numbers are not coming back. I've seen this movie before. I've seen this movie before. BRAZILE: Oh well you didn't watch in September 2011 and October 2011 when many of you, I don't know if you said it directly, said that the president couldn't come back because his numbers had dropped. BRAZILE: Are the people who voted for him. KRISTOL: I want to say is actually talking to a fair number of Republican candidates out in the House and the Senate, Republican Congress, Republican House isn't that popular. If you ask is Congress popular, no it's not. If you're an actual Republican candidate running in a competitive House seat or a competitive Senate race, you feel pretty good now. BRAZILE: And the Republican candidate in Louisiana ran to expand Medicaid bill. STEPHANOPOULOS: We only have a couple minutes left. I do, I don't want to let this moment pass without looking back at these events this week on the 50 anniversary of the assassination of JFK. And Matt, I have to say, I was actually surprised at how much this resonated across the country 50 years later. DOWD: Well I think it's, for first being an Irish-Catholic American it's a moment in time that all of us, we still have the pictures of John F. Kennedy are still in bars throughout everywhere we go. I think it's because it was a moment in time when there was all this hope and in one moment, for many people in this country, many Irish-Catholic, but many people including the Kennedy family, there was a complete loss of innocence. If you trace back sort of people's perceptions of where they wanted to go and what hope they had, you almost can trace it back to that day 50 years ago. STEPHANOPOULOS: And Cokie this hit home personally for you and your family of course, your father the Democratic Leader in the house when John Kennedy was serving. And I think we have a picture actually in the Oval Office just weeks before. ROBERTS: Yes both of my grandmothers happened to be in town at the same time, so that's my parents and my two grandmothers with Jack Kennedy on November 1, 1963. And he, and he was dear to them, he was very charming. And he said, where are the photographers, they're usually all over the place? I can't find a photographer. And then he found one to come in and take that lovely picture. But Matt is quite right. It was a time of such hope and such possibility. The country, the economy was booming. We had never lost a war. And young people being called to serve. And then it just all sort of went dark. STEPHANOPOULOS: And not surprisingly Bill Kristol 50 years later also sparked something of a political debate as we see that iconic picture of John Kennedy, Jr. Was John F. Kennedy basically a conservative or a liberal? KRISTOL: Well he was an anti-communist and a hawk and believed in strong defense. And the speech he was going to give in Dallas on November 22, was calling for tax cuts across the board to give people incentives to get the economy moving again. So in those two respects, I think he would have been a little more comfortable perhaps with the Republican Party of today than with the Democratic Party. STEPHANOPOULOS: He's still a Democratic icon. BRAZILE: You know another Catholic family with John F. Kennedy, Robert Kennedy, Martin Luther King of course; in our household we have Bill Clinton and Barack Obama. But he inspired a generation to change the country. He inspired people to tear down the walls of discrimination. And Lyndon Johnson implemented much of his vision. But he was such an inspirational figure. DOWD: It's interesting this is a moment when you don't know where the myth begins and reality begins. It's sort of myth and reality got so mixed up in so many people minds that they're still sorting out what was myth and what was reality. STEPHANOPOULOS: That's going to go on for a long time. STEPHANOPOULOS: Thank you all very much. When we come back, Facebook's Mark Zuckerberg on his new mission to Washington and Maya Angelou on her mom. MAYA ANGELOU: She said, baby wait a minute. I think you're the greatest woman I've ever met. And I thought, suppose she's right? STEPHANOPOULOS: That's our Sunday Spotlight. STEPHANOPOULOS: Coming up, he revolutionized the way we connect. And now Facebook Founder, Mark Zuckerberg is ready to shake up Washington. Our conversation with him is next. STEPHANOPOULOS: So there is Facebook Founder, Mark Zuckerberg taking his company public, becoming an instant billionaire. And now the 29-year-old is taking on Washington. Putting his brains and bankroll behind the push for immigration reform. He sat down with ABC's David Wright to talk about all that, the dangers of domestic spying, and his take on all those Obamacare website glitches. DAVID WRIGHT, ABC NEWS CORRESPONDENT: In a room full of hackers, the guy in the hoodie stands out. In fact Mark Zuckerberg counts as an elder statesman. The 29-year-old founder of Facebook is exactly the sort of success story these other bright, young faces hope to be. If the United States government allows them to stay in this country. DIANA TORRES, HACKATHON PARTICIPANT: I was undocumented (inaudible) action. WRIGHT: These young people are all undocumented immigrants taking part in a two-day hackathon organized by Forward.us, a Silicon Valley lobbying group pushing for immigration reform. Zuckerberg is one of the group's founders. MARK ZUCKERBERG, FOUNDER, FACEBOOK: I was teaching an afterschool program and one of my top students put his hand up, and he said, I don't think I'm going to be able to go to college because I'm undocumented. WRIGHT: For Zuckerberg, it was a eureka moment. ZUCKERBERG: When you meet these children who are you know, really talented, and they've grown up in America and they really don't know any other country besides that, but they don't have the opportunities that we all enjoy, it's really heartbreaking right? And it seems like it's one of the biggest civil rights issues of our time. WRIGHT: A civil rights issue? How do you mean? ZUCKERBERG: There are 11 million undocumented people living in this country. WRIGHT: Some would argue that all 11 million are breaking the law and have no fundamental right to American citizenship. What would you say to them? ZUCKERBERG: There are a lot of misconceptions about that. And a lot of them came here because they just want to work. They want to help out their families and they want to contribute. We definitely should make it so that they can, so that there's a path for them to come into the country legally as well. WRIGHT: That's the message of new ads Zuckerberg's group rolled out this week to put new pressure on Washington. NARRATOR: Tell Congress the time is now. Fix America's broken immigration system. ZUCKERBERG: The future of our economy is a knowledge economy. And that means that getting the most talented people into this country is the most important thing that we can do to make sure that the companies of tomorrow are founded here. WRIGHT: It seems obvious that Silicon Valley has an interest in stopping the brain drain. The harder case is for the non-skilled labor. ZUCKERBERG: You know and one of the things that the dreamers here today show is that even if you, you know, you're a child of someone who came here who wouldn't be considered one of the higher skilled workers, you still are probably one of the, you can be one of the entrepreneurs of tomorrow. And you know that's the American dream. WRIGHT: In practical terms forward.us is pushing for three things, more visas, especially for highly skilled workers, a pathway to citizenship for undocumented immigrants who are here, and securing the borders so that in the future, the only people here are here aboveboard. Earlier this fall Zuckerberg set aside his signature hoodie and put on a suit and tie for a round of lobbying on Capitol Hill. Are you more or less optimistic after your recent trip to Washington? ZUCKERBERG: I'm fundamentally an optimistic person, as an entrepreneur. The vast majority of Americans want this to happen. We have to push forward, it needs to happen. WRIGHT: We also asked Zuckerberg his thoughts on two other digital issues, NSA surveillance for one, Facebook has faced its own questions over user privacy but has pushed back hard against the government's wholesale collection of data. ZUCKERBERG: You know, I certainly think that we all want national security. We want to live in a safe country and we want to be protected from risks. WRIGHT: But is the route to safety through the mass collection of data? ZUCKERBERG: I think that these things are always a balance. In terms of doing the right things and also being clear and telling people about what you're doing. I think the government really blew it on this one. And I honestly think that they're continuing to blow it in some ways and I hope that they become more transparent in that part of it. WRIGHT: And there's the program where the president himself admits the government blew it, big time. The troubled website, health care.gov. What advice would you have for the president on his poor website? ZUCKERBERG: You know, sometimes stuff doesn't work when you want it to. We've certainly had plenty of mistakes and things that haven't worked the way that we want to. The right thing here is just to keep on focusing on building the service that you think is right in the long-term. WRIGHT: This is one area Zuckerberg has more expertise than the folks in Washington. But for now he's keeping his eye focused on immigration reform. A political coming of age for the Facebook founder and quite possibly, Silicon Valley. For "This Week" David Wright, ABC News, Mountain View, California. STEPHANOPOULOS: Yeah don't think he wants to go near that website. Thanks to David and Mark for that. And when we come back, Maya Angelou in our Sunday Spotlight. The poet talks about her latest book and the power of forgiveness. STEPHANOPOULOS: Our Sunday Spotlight shines this week on Maya Angelou. You see her there receiving a National Book Award this week for Lifetime Achievement. In her speech the poet said, easy reading is damn hard writing. And at 85 she is still hard at work on her 32nd book, just after finishing a memoir about her mom. Angelou talked about that and more with ABC's Susan Saulny. MAYA ANGELOU, AUTHOR: She was so beautiful. My brother and I, we would watch her carefully as if she was a, a butterfly. SUSAN SAULNY, ABC NEWS: One of the pivotal moments of your life, according to the book, was when she told you, I think you're the best woman I've ever known. ANGELOU: The greatest. She said, baby (inaudible) I think you're the greatest woman I've ever met. And I thought, suppose she's right? Suppose I'm going to be somebody? Goodness. SAULNY: That love and respect was mutual. Dr. Angelou was overcoming while reading us a passage about her mom's final moments. ANGELOU: But there's never been anyone greater than you, as a mother of a young adult. She squeezed my hand twice. I can't read anymore. I can't. Thank you. She's still very much with me. I have a photograph of her in my bathroom on the mirror. So each morning I go there to brush my teeth and see her smiling and looking at me. And approving of me. SAULNY: What a wonderful way to start the day. ANGELOU: What a wonderful way and she really thought I was the bee's knees. SAULNY: Dr. Angelou told us how she managed to find hope even in one of her most challenging moments. You were out with a boyfriend, he turned on you and kicked and punched and you were almost dead. ANGELOU: Yes. He beat me. SAULNY: How did you find the strength to overcome those sorts of things? ANGELOU: First I know that forgiveness is the greatest gift you can give yourself. It's not for the other person. I released the man from my care. I don't drag him around by not forgiving him. You must forgive. It's for your own sake. To rid yourself of that weight. SAULNY: But before she found her voice as an activist and author, Dr. Angelou had a different passion. It was a surprise to know that you were a Calypso singer and a dancer! ANGELOU: As far as that goes. NARRATOR: Ms. Calypso herself, Maya Angelou! SAULNY: Can you give us a sample of one of your favorite songs from those days? SAULNY: Yes, we'd love to hear a little. ANGELOU: I haven't thought of that song in 200 years -- good Lord! SAULNY: But you hit every note. ANGELOU: It's there. Nothing is lost. SAULNY: For "This Week" Susan Saulny, ABC News, Winston Salem, North Carolina. STEPHANOPOULOS: Boy that sure was a treat. You can see more of the interview on abcnews.com. Our thanks to Susan and Dr. Angelou for that. And now we honor or fellow Americans who serve and sacrifice. This week the Pentagon released the name of one soldier killed in Afghanistan. And that is all for us today. Thanks for sharing part of your Sunday with us. Check out "World News with David Muir" tonight and Barbara Walters' interview with President Obama and the First Lady, next Friday at 10. I'll see you tomorrow on GMA.